Give us a culinary hand, will you? Worldwide icon-chevron-right Europe icon-chevron-right United Kingdom icon-chevron-right England icon-chevron-right London icon-chevron-right Give us a culinary hand, will you? After our recent video on Chinese dumplings, we’ve been politely informed that bursting these lovely little parcels of culinary joy before they reach your lips really isn’t the done thing at all. So, first off, apologies to anybody who was peeved by our post. 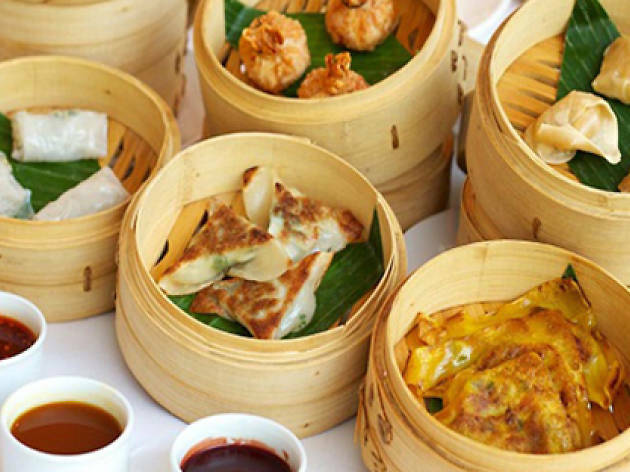 Secondly, we'd like to invite the knowledgeable food-lovers of China and Asia to tell us what traditional delicacies we Londoners should try - and how to eat them properly. We’re an inquisitive bunch at heart you know, and while we don’t always do things the traditional way, we’re always looking to learn. So please, do us a favour and give us a steer on what to chow on next by adding a comment or two below. We'll publish the best suggestions. Thank you! "Secondly, we'd like to invite the knowledgeable food-lovers of China and Asia to tell us what traditional delicacies we Londoners should try - and how to eat them properly. We’re an inquisitive bunch at heart you know, and while we don’t always do things the traditional way, we’re always looking to learn." Maybe next time, you guys should do this BEFORE you give offensive comments? Jackass. You might really enjoy stinky tofu. It's a Taiwanese specialty known as chou doufu. You might also dig deep fried pork intestines. And lastly there's a favorite of British lady food writer Fuchsia Dunlop, rabbit heads. Did I forget durian pizza? If you come to the Chinatown of Flushing Queens I'd gladly purchase all of the above for you. As a Chinese-Singaporean, I'm scared to recommend other Chinese/Asian food to you guys. What if you do the same sh*te again and unwillingly offend another ethnic group of peeps? It's ok. Just stick to your fish&chips, bangers&mash. It would be great to know a bit more about the diversity of TimeOut London's employee base. Does the ethnic diversity of your workforce match up with London's ethnic makeup as a whole? Do you make conscious efforts to recruit staff from a range of backgrounds and communities? Send us some stats, please! i'll do you a big favour and give you a big culinary tip - stick to your fish and chips..
How about the apology for comparing it to a pus-filled pimple? I think that was more offensive actually. Also, you might consider hiring more Chinese or Asian people to join your team. I know a few who'd happily join your foot beat, myself included! This is such a nonapology. Like, just one sentence that boils down to "sorry, you were offended". Then you ask us to do the research you should have done, with Asian writers you should have hired. For free. You're lucky that all these other folks are so willing to give you more material to colonize (well, colonize AGAIN) with your hacky food fad garbage. The only Chinese food I can recommend that you can help yourselves to are these two birds I've got here. How's that for "a hand"? The original video was hilariously ignorant and would never have happened if a single Chinese person was consulted before publishing the video, but this attempt at an apology is a good start. Maybe before posting these videos, ask a server how to eat it? Or a person who comes from that culture?? How to eat soup dumplings: Put a little vinegar in a soup spoon then slowly nibbling a corner and then slowly sucking the juice out. This will make sure that one gets all the best juice out of the dumpling out instead of scalding their mouth. I am really glad they apologized, I was angry that they ate it wrong too, but after they apologized I was not angry anymore and I think its kinda too harsh to be scolding them over food. The purpose of the Chinese delicacy , the 小笼包, is that it is completely different from dumplings. It is more expensive, and holds higher cultural standings than dumplings, the reason being that it is more complicated to make. The soup that your video article found amusing to waste, is what makes the delicacy a delicacy. The soup is meant to be consumed, not "popped". "Exploding" as you so crassly put, erases the necessity for the process of steaming the 包 until it melts the gelatin aspic, containing them within the 包，a key aspect within the making of the 小笼包. Don't explode the dumpling, use your chopsticks and place the dumpling onto a spoon, essentially preserving the soup in the 小笼包 until it reaches your mouth. Alternatively, you could drink the soup before eating it, or adding sauce. There are many ways to eat it, but your video highlights probably the only way you're not supposed to eat it, which is "exploding" it and WASTING THE SOUP. My main qualm with the video is the fact that you feature a Chinese delicacy, savoured by millions in China, holding such cultural significance, and you DID NOT BOTHER TO FACT CHECK. Two minutes on google could solve literally this entire debacle, or asking someone from China, hell, even the TIME OUT BEIJING, HONG KONG OR SHANGHAI BRANCH. It is not exactly classified information. You, are what is the problem with new media in recent years. Your lack of insight or use of truthful information is why no one trusts news outlets anymore. THIS COULD HAVE BEEN SOLVED WITH 5 MINUTES ON GOOGLE, yet you waste this fantastic topic through your ignorance on all topics that aren't western norms. Fix this, remove the video, and correct your mistake. It is not a crime to make mistakes, but not acknowledging them (which you did, props to you), and removing the factually incorrect video will cause more ignorance. The best way to eat those soupy dumplings, known as Xiao Long Bao, is firstly, to bite off the top bit of dumpling skin. This makes a small hole at the top, through which you can drink the soup out of. Then add soy sauce and vinegar mixed with shredded young ginger to your liking, and pop the whole thing into your mouth! Alternatively, you can make a hole with your chopstick on the side of the dumpling so the soup fills up your spoon. Then add soy sauce and vinegar to your liking once again, and pop the whole thing into your mouth to enjoy.